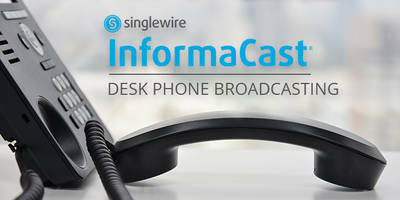 Singlewire Software’s new Desk Phone Broadcasting for InformaCast Fusion expands the compatibility of the software. This allows organizations to use desk phones as speakers to broadcast live and prerecorded audio messages in an emergency situation. This software offers the platform to almost any IP phone, enabling organizations to reach people wherever they are with intrusive means of getting people’s attention. This software brings a quick and reliable way to keep people informed during potential safety issues. Madison, Wis. (Oct. 5, 2018) – Singlewire Software, a leading emergency mass notification service provider, announces the release of Desk Phone Broadcasting for InformaCast Fusion. This release broadens the compatibility of InformaCast Fusion to integrate with non-Cisco phones. Organizations will be able to utilize desk phones as speakers to broadcast live and prerecorded audio messages in the event of an emergency. “One of the top questions we get from potential customers is, ‘What if we don’t have Cisco phones?’” said Pat Scheckel, executive vice president of product management and marketing for Singlewire Software. The release extends the InformaCast Fusion platform to almost any IP phone. This helps organizations reach people wherever they are, and offers an intrusive means of getting people’s attention. Desk phone broadcasting is part of the latest InformaCast Fusion update. For more information on this and other new features, visit www.singlewire.com/informacast. About Singlewire Software Singlewire Software, based in Madison, Wis., is the developer of InformaCast, a leading software solution for fast and reliable emergency notifications. More than 7,000 organizations in over 50 countries use InformaCast for emergency notifications and IP phone paging. Whether it’s an active shooter, severe weather, or another crisis situation, InformaCast helps reach the right people, with the right information, to increase awareness, safety and security. To learn more, visit http://www.singlewire.com/informacast.